James “Rhio” O’Conner is a man who made history by outliving his prognosis by six years. This man was diagnosed with mesothelioma, a form of cancer said to be incurable. James was diagnosed with pleural mesothelioma, and was given less than a year to live. He didn’t take the news lightly; He refused to let the cancer beat him. He dedicated himself to doing countless hours of research. He won the battle by turning months left to live, into seven and a half years. Mesothelioma is a rare form of cancer that affects internal organs. Like other forms of cancer, the infected cells metastasize out of control damaging tissues, cells, and organs. This cancer is a result of exposure to asbestos. Given that mesothelioma symptoms don’t show until thirty to fifty years later, many people have been exposed to asbestos in their early years. In the early 1900’s many people were openly exposed to asbestos in the work field without knowing the harmful facts. Now, the Occupational Health and Safety Administration created many regulations limiting jobs that expose people to asbestos. Today, we have protective gear that reduces exposure as well. It is safe to say that the United States is aware of the negative effects asbestos has on the working population. When a patient is diagnosed with mesothelioma, they generally are only estimated eight to twelve months left to live. Patients usually have the option of chemotherapy, but that often dulls a patients’ life and doesn’t have a high success rate in removing the cancer. Some patients also have the option to surgery to remove the infected area. Radiation therapy is also an option; this technology uses high doses of x-rays to essentially kill the cancer. James “Rhio” O’Conner had a slightly different case. The Author says, “Surgery was not possible because of the position of the tumor near his spine and chemotherapy would decrease his quality of life and not significantly improve his length of life” (“James”). James decided to take matters into his own hands. He created his own therapy. When James O’Connor started researching, he spent countless hours in the library. He also spoke with many doctors, and even his fellow mesothelioma patients. He had a team of doctors helping him create remedies using the philosophy and typical protocol of mesothelioma treatment. James O’Conner and his doctors formed a one hundred supplement regimen that he was taking daily, and he changed his diet. Most recognizably, James relied on himself for mental support. He never gave up. He practiced mind-body medicine. The medical center at the University of Maryland says, “Mind-body medicine uses the power of thoughts and emotions to influence physical health” (“Mind-body”). James “Rhio” O’Conner is a very remarkable man in my eyes. Doctors told him that he was on his death bed, and to make arrangements for his family. Instead, he proved all of the doctors wrong. He lived 6 years longer than expected with a virtually incurable disease. In my eyes he’s a hero, iconic even. I went through many years of cancer treatments with my beloved Grandmother. She too was a fighter. She beat vaginal cancer, as well as laryngeal cancer. Different from James O’Conner, she went through years of chemo, as well as radiation. Luckily that was a successful treatment option for her. She was a very spiritual woman, and I believe that she too practiced mind-body medicine. She was a woman of God who believed anyone could do anything if they had the power to believe in themselves. She is no longer with us today, but I know that she is around me all the time. She was an inspiration to many. She touched the lives of thousands through the church as well as the hospital. I think that she and James O’Conner are very much alike. If I was ever in the position that doctors told me I was on my death bed, I hope I would have the power to believe in myself enough to overcome the setback. If I could, I would follow exactly in James footsteps. First, I would lay out all of my options and look at the pros and cons of each treatment. I wouldn’t exactly look beyond chemo and radiation, given that everyone’s situation is different. For example, chemo worked for my grandmother but not James. I think everyone would feel uneasy until they felt confident about what exactly they were diagnosed with. I’m positive I would put in the utmost effort to make myself more knowledgeable. I would put my fate in the hands of God; I feel that he gives certain people the option to beat the odds. James “Rhio” O’Conner and my grandmother, Virginia, were most definitely two people who beat the odds. Like James, I would team up with the most trusted doctors to find a remedy. I think that I would be more of the type to use trial and error. I would try almost anything, except for taking dozens of medications day in and day out. One thing my grandmother taught me was don’t let doctors fool you by telling you that you’re better, when in fact you only feel better from the medication. I would try to keep things as natural as possible. I also would take any and all suggestions from friends and family. Most of all, I would never give up. James “Rhio” O’Conner is a very inspirational man in his spiritual ways, and I hope that his story is recognized by many more people to come. I believe that his story has the power to encourage cancer patients today to never lose faith. 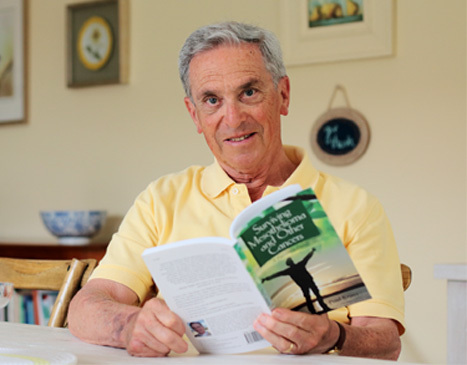 “James ‘Rhio’ O’Conner.” Surviving Mesothelioma: A Patients Guide. Cancer Monthly, 2005. Web. 21 Feb 2010. “Mind-body Medicine.” University of Maryland Medical Center, 2009.